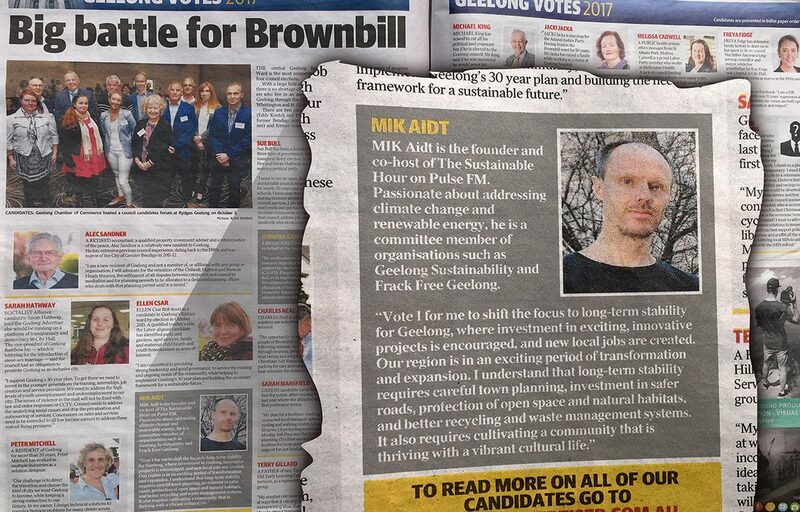 “Big battle for Brownbill”, the Geelong Advertiser titled a spread containing the newspaper’s own presentations of how they see each of us 18 candidates for Brownbill Ward in Geelong. The Addy and I may be disagreeing on energy policy, but I must give them full credit and thanks for how accurately they were able to present my candidate program in the paper today. The short text pretty much sums up what this new face Mik is about. A lot of Geelong residents I have talked with say that they want to see some new faces in Council, so that’s encouraging to hear. I met quite a few of my fellow candidates in the streets of Geelong West today. And I have to say, in reference to the Geelong Advertiser headline, that this election hasn’t felt like much of a “battle” at all. More like a friendly competition. Whenever I meet the other candidates, everyone’s smiling, talking, exchanging thoughts and experiences, shaking hands. One candidate was even helping me with handing out my flyers out to bypassers today, while I was helping someone else with moving some boxes. There is a sense of that we are in this together, and there already is a feeling of unitedness around how we’ll be proceeding from here. Now it’s up to you, the voters, to decide what our new Council should look like. “Mik Aidt is the founder and co-host of The Sustainable Hour on Pulse FM. 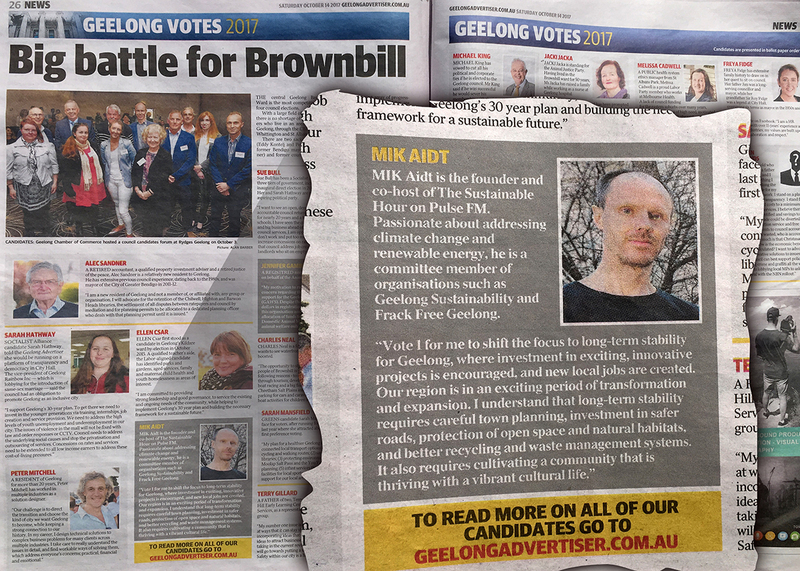 Passionate about addressing climate change and renewable energy, he is a committee member of organisations such as Geelong Sustainability and Frack Free Geelong. Posted On 14 October 2017 14 October 2017 in News with 0 Comments.